The Aetherian Archive is a ruined tower in western Craglorn, overlooking the city of Elinhir to the south. 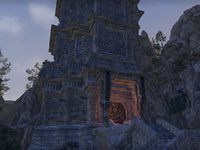 The tower was built by ancient Nedes in the Merethic Era, and predates the nearby towers in Elinhir. According to local legend, the three towers at Elinhir were constructed in homage to the Archive. It served as the home of the Firstmages, a group of elven mages completely dedicated to achieving magical power. The mages assembled a great library in order to study magic and Aetherius, before casting impenetrable wards to eternally seal themselves inside. The mages obtained incredibly long lifespans due to their magical power, allowing them to study indefinitely. They fervently worshipped the Mage constellation, which they called the Learned One, in the hopes of unlocking even greater mastery over magic. The Archive remained sealed for several thousand years. In 2E 582, the constellations fell from the sky above Craglorn and took on mortal forms, known as Celestials. The Mage was then targeted by the Serpent, who corrupted her Apex Stone and split her Celestial into many aspects. This allowed the Serpent to take control of the aspects one by one, although this process was stopped by the Thief, who guided the Soulless One in gathering the remaining aspects before they could be corrupted. After weakening the corrupted Lost One, the aspects joined themselves to her in an attempt to resist the Serpent's corruption, and the confused Celestial Mage subsequently fled to the Aetherian Archive, shattering the wards. Once inside the tower, the Mage's uncontrolled power caused the interior to warp, transforming it into an impossible landscape of floating islands. She summoned powerful atronachs to keep back the Firstmages, who attempted to reach her to earn her favor. Many of the Firstmages instead entered her service as guardians, although a small minority exited the tower in fear of their lives. The Undaunted were then quickly made aware of the opening of the Archive, and flocked to the tower in an attempt to be the first to scale it. Under the guidance of the Thief, a group of Undaunted "ascended" the tower and fought through the Mage's guardians before defeating the Celestial herself in battle. Freed from the Serpent's influence, the Mage departed the Archive to help the Thief contain the Serpent's growing influence. This page was last modified on 25 March 2015, at 16:24.